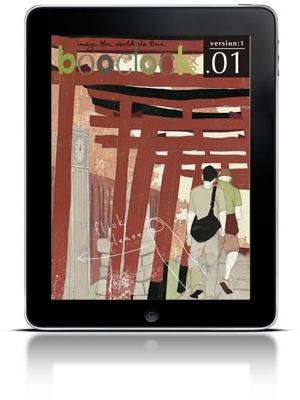 booclock is a time-themed iPad art book. It contains a collection of various “landscape with a clock” illustrations. The clocks drawn show the current time just like a real clock. booclock is also collecting everyone’s “landscape with a clock” photographs. Photographs can be posted via the “Here”. Some of the photographs sent will form the basis of new illustrations. They will bedelivered irregularly and updated like a quarterly magazine. Someone’s time in a city somewhere. -Selection of the photographs is solely at our option. -Copyright to the illustrations created from the selected photographs belongs to bolabo.lab. The illustration of 19 variations is collected to booclock now. It is an official site of booclock. Everybody is waiting for the photograph and the contribution of the comment etc.